The following is from the Introduction to the Population Genetics Management Plan for pallid sturgeon in the Upper Missouri River Basin. Pallid sturgeon (Scaphirhynchus albus), are highly endangered throughout their range and were listed under the Endangered Species Act as endangered in 1990 (Dryer and Sandvol 1993). Pallid sturgeon are especially imperiled in the upper Missouri River basin where no natural recruitment has occurred for several decades and the few remaining wild pallid sturgeon are very old (Webb et al. 2005). Hatchery propagation was implemented in the upper Missouri River to prevent extinction of the species which was predicted to occur in the early decades of the 21st century as the remaining wild pallid sturgeon died off (Kapuscinski 2002). 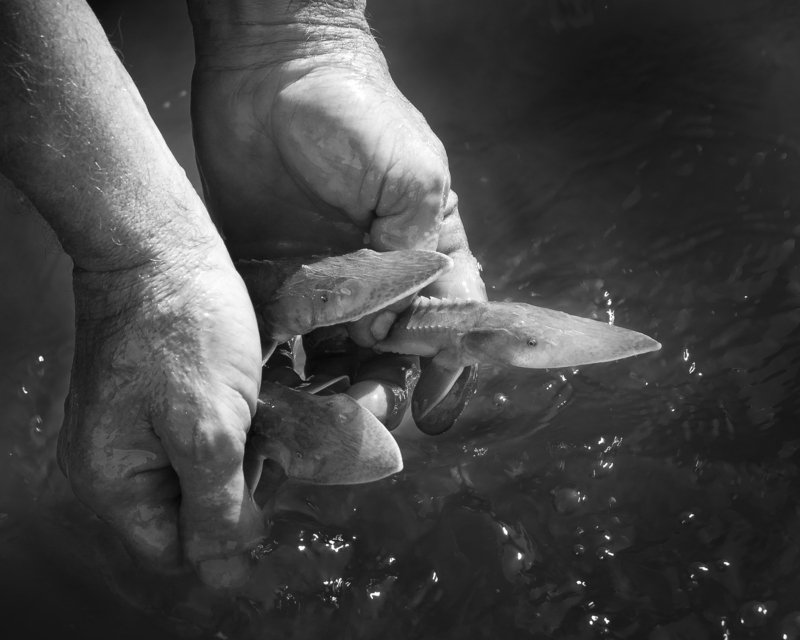 These efforts have been successful in increasing the numbers of upper Missouri River basin pallid sturgeon due to high survival of a large number of hatchery produced fish stocked into the wild. Hatchery reared offspring are also maintained in the Gavins Point National Fish Hatchery (GPNFH) Captive Broodstock Program. Thus, the upper Missouri River population of pallid sturgeon is no longer in imminent risk of demographic extinction. However, if a relatively small number of wild adults contributed large numbers of offspring to both the captive broodstock program and the wild stockings, the next generation of upper Missouri River pallid sturgeon may have reduced fitness and evolutionary potential due to a loss of genetic variation and the potential for inbreeding. The use of genetic tools for monitoring and assessment of pallid sturgeon restoration has been well integrated into the recovery program for purposes such as identification of Scaphirhynchus species and their hybrids (Schrey et al. 2011; Schrey et al. 2007; Tranah et al. 2004; Tranah et al. 2001), identification of hatchery produced fish (DeHaan et al. 2008), and to evaluate hatchery practices (Saltzgiver et al. 2012). The availability of individually-based genetic data along with existing data on propagation, and stocking history for pallid sturgeon in the upper Missouri River basin recovery priority management areas (RPMAs) 1-3 allows for evaluation of reproductive contribution and determination of potential of inbreeding through artificial propagation. Integration of these genetic monitoring results can be used to guide the recovery program to achieve the goals of maintaining genetic diversity, and also provide guidance to continued stocking, hatchery, and management efforts within the upper Missouri River basin. However, it must be realized that the molecular markers used to make these assessments (chiefly microsatellites) presumably have no direct effect on the fitness of the sturgeon. Thus, it makes no sense for managers to focus on conserving microsatellite alleles per se. They are, however, indicators of how processes such as genetic drift, gene flow, mutation, and overall maintenance of diversity between generations are occurring in the surveyed populations. Because these markers are inherited from both parents, microsatellite data allow us to estimate levels of genetic diversity and relatedness and/or parentage to design hatchery crosses because patterns at such loci are expected to reflect levels of the loss of genetic variation and the amount of inbreeding that that may be occurring over the entire genome.